One year after the Great March of Return began, health workers in Gaza are facing an unprecedented challenge: salvaging the limbs of protestors that Israeli forces have targeted. During the year, more than 29000 people have been injured, with over 7000 of the injured shot using military ammunition, many by army snipers. Around 90% of those shot were injured in the lower limbs. Sniper bullets, designed to kill at distances of 1000m, are being fired at targets from a much shorter range. The devastating injuries that this causes means that on average each patient needs between 5 and 9 surgeries before their wounds can heal. This treatment journey will last for a minimum of 2 years. These injuries are inflicted on protestors in response to their calls for a return to their land and an end to the siege on Gaza that has lasted for more than a decade. There is something distinctly cynical about targeting peoples’ limbs as a response to them walking to the fence of their prison to protest. Last week, a medical experts meeting was held by Medecins sans Frontieres / Doctors without Borders (MSF) in Brussels to discuss the challenge of providing reconstructive surgery to these patients. 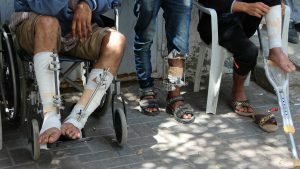 On the basis of data from Palestinian surgeons and international organizations currently in Gaza, there are between 800 and 1200 young Palestinians still awaiting lower limb reconstructive surgery. Palestinian surgeons from Shifa Hospital, Gaza’s largest hospital, described how the majority of those shot in the lower limbs were targeted in the lower thigh and back of knee where a single bullet can find its way to nerves, arteries and the knee joint all at once. The devastating nature of the injuries means that around 20 to 40% of patients will sustain bacterial bone infections, further complicating the clinical management of their wounds and burdening an already struggling health system. The presence of multidrug resistant bacteria makes treating these infections both difficult and costly. These infections, if not promptly treated, risk adding to the already 124 Palestinians who have thus far needed amputation of an unsalvageable limb. A further 15% (approximately 980 people) have permanent nerve injury leading to more disability. The people of Gaza are being debilitated for their demonstrations against the siege and for the right of return. This is the epitome of disproportionality. The act of salvaging those limbs targeted by Israeli forces is a medical act of humanitarian defiance. In response to the need for specialized limb reconstruction surgery, MSF has tripled its capacity to provide medical activities in the Gaza strip. One project is in partnering with the Union of Health Work Committees to set up a specialist limb salvage unit at Al-Awdah Hospital in Jabalya Camp in northern Gaza Strip. Palestinian and international health professionals of all specialities and disciplines work together in providing complex medical care that aims to reduce the disabling effect of these injuries on such a large number of previously able young people. Photo by Laurie Bonnaud © MSF, 2018.